Has really no one posted the newpix? also: this is odd, should I be able to post pictures? Last edited by susanoodin on Tue Apr 16, 2013 9:10 pm UTC, edited 1 time in total. susanoodin wrote: Has really no one posted the newpix? maybe images don't count as links? Or maybe you're just special. Don't tell anyone though. Last edited by udscbt on Tue Apr 16, 2013 9:18 pm UTC, edited 1 time in total. Is Megan pondering, or stifling a yawn/burp/barf/hiccup/giggle? THE NEWPIC OF THE BEAST! I applaud Blitzgirl for her tireless effort in clearly delineating each Period of Time. I would like to propose that Time can also be divided into two Eras--The Castle Era and the Scaffolding Era. The two era are distinct not only in terms of building materials but also, I think, of mood. 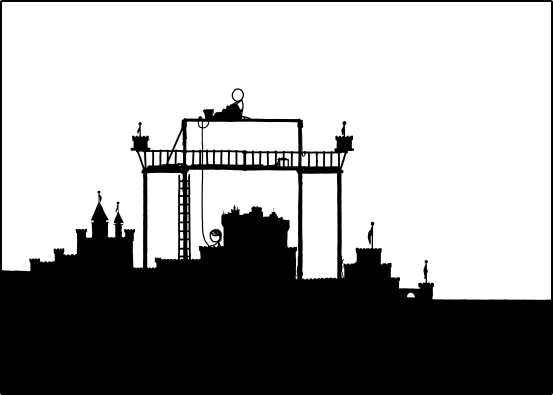 In the Castle Era, the two are relaxing on the beach and decide to build a castle, and a bigger castle. The whole thing, the recursive castles, the trebucheting of the castles, all seems to have a sense of play. And as Cueball says at the end, "It's been fun. . ."
I can see either working well. You make a good point, treadman, but I must say that my instincts tell me that fhorn's placement of the silence is, perhaps, the better flow in the big picture. I think what my gut is saying is that the proper response to "Maybe it's coming out of the ground" is "Does that happen? ", and that "I don't know" links well to "I don't know how the sea works" through the intervening silence as an elabouration on the same thought. I've been thinking and I think we should have a tournament for the Knights Temporal. To test a Knights resolve and faith in Time we would pose a Quest and see which valiant Knight or would be Knight can complete it best. Each Quest shall be the search for a deep truth held within the Forum of Time. Each Contestant will make only ONE entry POST and edit it if they find more evidence to support their claim. Contestants may be asked to provide links to the original posts the quotes came from which can be given in another post after the DONG. Also made up quoting is not allowed. The Organizer should give an indication of when the question will be posted and it should be posted a set time before the next DONG so that their is enough time to answer it. Questions often can have multiple parts like asking where something came from and also what lead to its introduction. This means more than one quote may be needed to fully complete the Quest. Entrants don't have to fully ordained Knights and winners may be granted honorary Knighthood or other titles and prizes. Seems like Pope histrion is right. Congrats! Ritalin doesn't work on XKCDADD, you need Randallin. Last edited by edo on Tue Apr 16, 2013 9:55 pm UTC, edited 1 time in total. Ritalin doesn't work on XKCDADD, you neen Randallin. What exactly would you take for xkOCD then? I like that the Leader asks the questions, but not so much that it should be a hard and fast rule. I agree with your gut: The People finally get concerned, asking their first question: "Does that happen? ", with the Leader finally admitting for the first time, "I don't know." Pause. "I don't know how the sea works." The People lament, "I don't know how anything works", reiterating that they are followers and know even less than the Leader. Latent22 wrote: I've been thinking and I think we should have a tournament for the Knights Temporal. Other Knights may be pleased to take up the challenge but I'm awfully busy right now, trying to deal with the ducks flying vegetables. They seem to be making no efforts to continue holding back the sea, which implies (corroborated by their dialogue) that they have no knowledge of how high the sea will rise. Metaphor for civilization seems to be working out still...their original structure (the old civilization) is about to be wiped out, so they're building up on stilts (away from the river valley) using more complex tools (buckets and pulleys). Maybe the "sea" itself is a metaphor for Time, and how older things are doomed for destruction but we can keep building up to escape Time's relentless force. C: Does it rain on the sea? C: If it does, it seems like a waste. C: It rains in the hills where the river comes from, right? C: Are there other rivers? C: There must be other rivers. Otherwise the sea would dry up. M: Maybe it's coming out of the ground. M: I don't know how the sea works. C: I don't know how anything works. These two may have building abilities, but they're real dimwits. Gee Willikers! It's been staring us in the face the whole time! How did we miss it.. "Time" isn't a metaphor for anything, it's actually an acronym for "Totally Immersive Marshmallow Eukaryotes" .. it all makes sense now. So, having said my hellos a couple of pages ago, I'm happy to be joining all you other kids in the sandbox. I know I had a few theories about where Time is going, but I kept thinking I should read ahead more before I dove in...350 pages later I finally caught up, all my theories disproved or forgotten along the way! And just to show you how insane I have become, I've decided that something original I can contribute is a soundtrack for our trek -- I have chosen the title of Larghissimographer , and started to skim back through the thread (about 50 pages so far) to pick out all of the musical pieces that have been mentioned, and added them to a new page on the xkcd-time.wikia -- from the Main Page, follow the link to the xkcd Time Travel Mix! In addition, I'm collecting the available tracks into a public playlist for anyone who has the Spotify client; see the wiki page for a link. I'm sure there are many more Timely songs to be added to the playlist, but unless they add something to the overall discussion, cluttering up the thread with suggestions probably isn't desirable -- Spotify users can collaborate directly and add songs themselves (just ask, I'll Share the list), and anyone can add suggestions directly to the wiki page (or use the wiki's Comments section at the bottom of the page). I've been enjoying listening to the eclectic pile of songs as I collect them, I hope you'll enjoy them too! That's quite a huge change between the last two newpix. I don't think we've seen anything like this in the history of Time. They've not only made a pulley, but also used it about 3 or 4 times. mscha wrote: That's quite a huge change between the last two newpix. I don't think we've seen anything like this in the history of Time. The sea level has changed some. Yeh, but only cuz Megan's totally peeing in it. Kinda puts a different spin on Cueball tasting it now. Cancer and Babies are references to the Mad Speculation that there was a secret message that one or the other or both were happening to Randall's wife. We can also see that the castle is getting undermined a little. Something to keep an eye on! Edit: If 1 N00b bumps this post I'll be Pope! Last edited by Latent22 on Tue Apr 16, 2013 11:00 pm UTC, edited 1 time in total. I'm almost sad to see their castles start to crumble. But they're raising sand up to the tower, to build a castle up above. So it's not all bad. I'm in a very contemplative mood right now. Yeah but think about what happens if they decide to do a copy of the castles below. will they have to slowly erode the copy over time after they have finished? Then once they have done up there and they just have a slope of wet sand up the top they can make small stick figures of themselves and do a stop motion animation of them building castles! Camera zooms in and we start looping. Getting smaller and smaller each time. With tiny stick figures animating even smaller ones etc. Last edited by Latent22 on Tue Apr 16, 2013 11:09 pm UTC, edited 2 times in total. But then, that whole book is about Time (howbeit that some here would call it heresy, being a Loopist sermon par excellence). Oh, god.., she's gonna use the rope as a noose to hang herself! "C: You're waiting for a train. A train that'll take you far away. You know where you hope this train will take you. But you can't know for sure. Yet it doesn't matter. Now, tell me why? M: Because you'll be together! M: You're infecting my mind! C: I was trying to save you. M: You betrayed me, but you can still make amends. You can still keep your promise. We can still be together, right here. In the world we built together. "